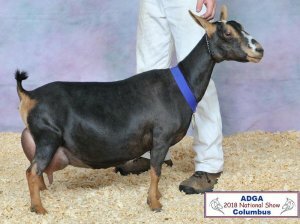 “Dressy” as we call her, is the daughter to the 2018 ADGA Reserve National Champion. 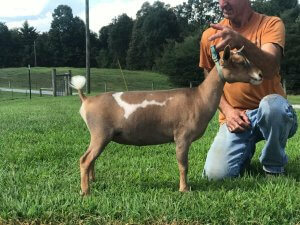 “Dressy’s” Dam is pictured below from the 2018 ADGA National Show. 2*M SGCH Old Mountain Farm Shy Elk 2*D is owned by Dan and Margot Cassel at CUatLilRedBarn.